"The purpose of art is washing the dust of daily life off our souls." --Pablo Picasso. Art is a creative form of expression, and the performing arts provides an outlet to express creativity by stimulating one or more of our five senses. LCFA has partnered with Melon Patch Community Theater, Central Florida Film Festival, Riverwind Flute Circle, Celebration Dulcimers, various dance instructors and many regional songwriters and performers to bring Performing Arts to our co-create space. We host special events and programming including second stage productions produced by Melon Patch Community Theater and short film viewing, and film educational workshops as well as monthly gatherings for the Riverwind Flute Circle, Celebration Dulcimers, and the Leesburg Ukulele & Guitar Club. 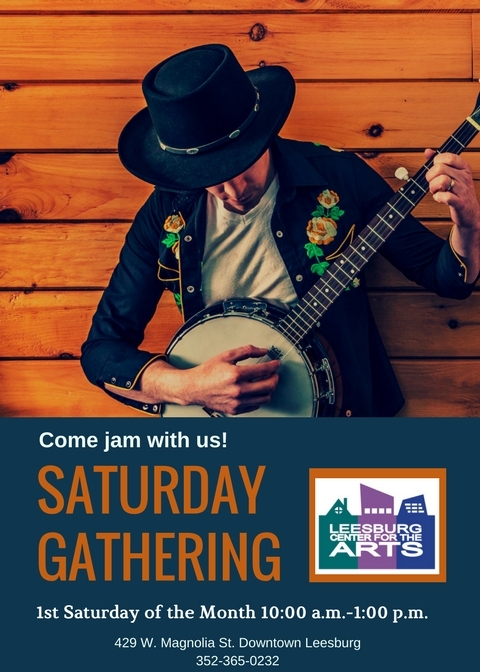 Join a group or class, come and jam and be a part of the performing arts in Leesburg! 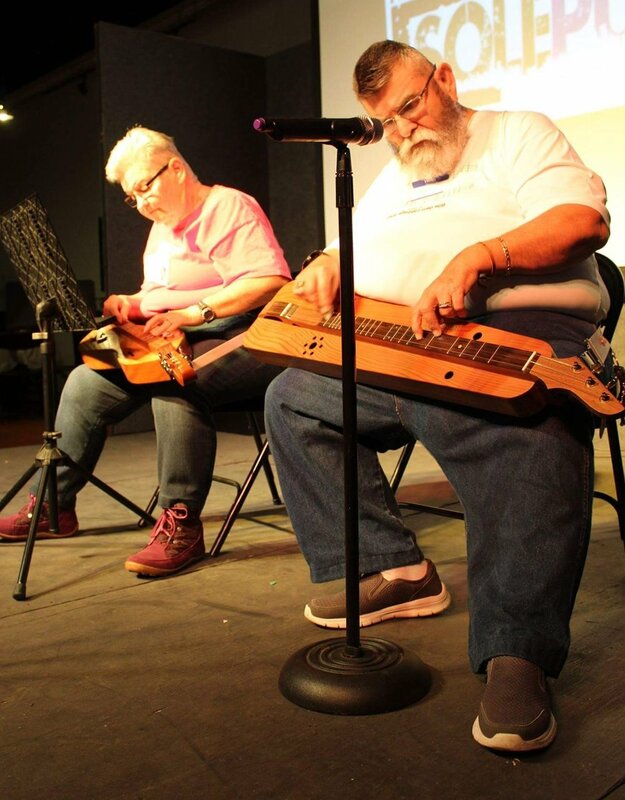 Dennis and Ellen Waldrop, Celebration Dulcimers performing on stage at the annual Sole Purpose event. 3RD WEDNESDAY of the month 6:30 p.m. The LCFA provides an atmosphere where people can make and share the creative things that juice them all while hanging out in a safe urban environment. Share your music, dance or sing, perform clean comedy, show your short film or photo presentation. We only ask that in order to keep the space "chill" that you avoid politics, religion and profanity. It’s the best vibe in town! $5 COVER for NON LCFA MEMBERS. become a member & attend for free. 2nd Thursday of every Month 6 p.m. The Ukulele club provides a welcoming space for players to have fun playing with others. In time there will be performances at various community events and other venues. We welcome players of all ages who have playing experience at the advanced beginner level and above. And, yes, we will sing! We’ll play various types of music from traditional to contemporary, ranging from the 20s/30s/40s to present. Bring your ukulele and music stand. Feel free to visit a time or two before deciding if you’d like to join. 1st Saturday of every month 10 a.m - 1 PP.M. DRUM CIRCLE 1 P.M. - 3 P.M. Celebrate your community with music, story and song! The first Saturday of each month is the GATHERING. Free and Open to the public. From 1 p.m. - 3 p.m. the Leesburg Drummers meet in circle. Meet members of the LCFA supported: RiverWind Flute Circle, , Ukulele (& Guitar) Club, and various drum circle lovers and acoustic musicians. All are welcome.